Increasing number of IT cos and mushrooming of newer gated communities expected to ensure larger occupancy for airport metro. 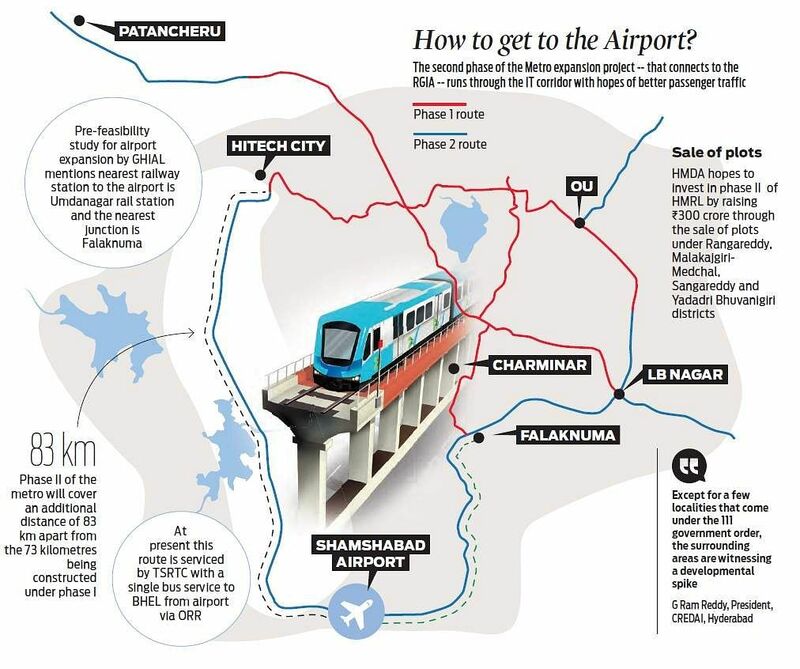 HYDERABAD: The proposed phase two of the Hyderabad Metro Rail, extending up to Rajiv Gandhi International Airport in Shamshabad from Raidurgam, is seen as a big move to further encourage the fast-paced development of the IT corridor. The IT capital and mushrooming of newer gated communities outside of Raidurgam and Gachibowli is also expected to ensure larger occupancy rate for the airport metro corridor. At present, thousands of cabs enter the Gachibowli area via ORR everyday indicating residence of large IT population on the outskirts. The phase two of the metro will cover an additional 83 kilometre apart from the 73 kilometres being constructed under phase one. At present this route is serviced by Telangana State Road Transport Corporation’s Pushpak (TSRTC) with a single bus service to BHEL from the airport via Outer Ring Road (ORR), touching financial district. The proposed Raidrugam metro station is approximately over 30 kilometres away from the RGIA. 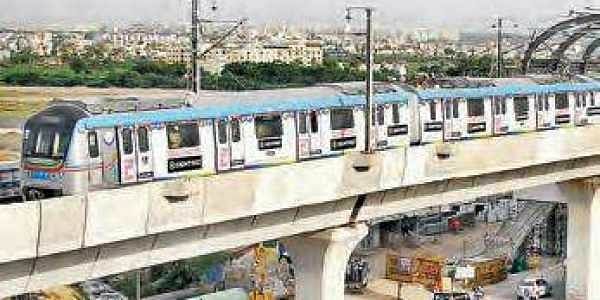 At present, the Hyderabad Metropolitan Developmental Authority (HMDA) hopes to invest in phase two of the Hyderabad Metro Rail project by raising `300 crore through the sale of plots under Rangareddy, Malakajgiri-Medchal, Sangareddy and Yadadri Bhuvanigiri districts.“The locality and the surrounding areas where the Hyderabad Metro Rail’s phase two project is coming up, the real estate rates are booming. The new headquarters for the Rangareddy district has sparked a lot of developmental activity in that area,” said G Ram Reddy, President, CREDAI, Hyderabad. “Except for a few localities that come under the 111 government order, the surrounding areas are witnessing a developmental spike. There are many developmental projects being undertaken along the ORR. Even at FAP city, the dream project for which the state government had allotted over 1,000 acres, activities have improved. Electronic city and the Pharma city projects are also coming up in those areas. All these factors have contributed to the land rates going up,” he added. But some disagree, “What is the point of operating a metro line on an expressway where no one can access it?,” wonders GSR Chaitanya, a transport researcher and policy advisor. “It would be better to have it someplace where more people can use it. The proposed metro line is an express line, it’s too early to have it in this proposed route. Given the cost, it would be better if HMRL just extend the MMTS line from Umdanagar or metro from Falaknuma,” he added. You don’t get big tracts of land and not many open spaces are available for undertaking big developmental projects in the Faluknuma,” said Reddy. “It’s a hurdle for development. Small tracts of lands means there will be a lot of stakeholders, and that brings in a lot of challenge to developers interested in that locality,” he added. A pre-feasibility study for airport expansion by GHIAL (GMR Hyderabad International Airport Ltd.) mentions that the nearest railway station to the airport is Umdanagar rail station and the nearest junction is Falaknuma. The Umdanagar railway station is also a waypoint for those travelling to Hyderabad via rail from Bengaluru, but do not wish to travel all the way to Kacheguda or Secunderabad. The station is also located close to the Bengaluru-Hyderabad highway. Under the phase II of the MMTS expansion, a dedicated train corridor from Secundrabad to the airport was being planned from 2009. Even a feasibility study was undertaken. In June 2011, when the two Telugu states were one, the then AP government wrote to the Centre seeking funds for a dedicated metro line to the airport. However, the proposal was rejected. In 2018, the connectivity to the airport via any form of rail is still years away. “The expansion work from Umdanagar station to the airport is progressing. Rail Vikas Nigam Limited still is in talks with GMR regarding the project,” said a spokesperson for South Central Railways. “There are lot of IT people who frequent the airport and there was a request. Extension from Shilparamam to Raidurgam will benefit them. Extention from Faluknuma and LB Nagar are also part of proposal,” said HMRL spokesperson.